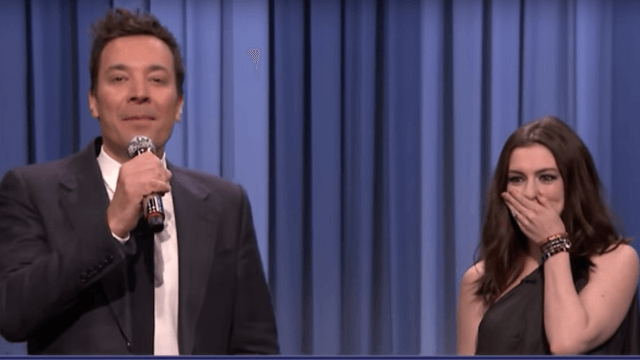 Anne Hathaway and Jimmy Fallon sing songs that have been butchered by Google Translate. Anne Hathaway joined Jimmy Fallon on The Tonight Show last night to sing a few pop tunes with a major twist. The lyrics of the songs were first translated to a different language and then back to English through Google's shoddy translate function, altering the lyrics in a hilarious way. Things definitely got lost in translation. Hathaway started by belting out "Can't Feel My Face" by The Weeknd, now entitled "My Front is Not Felt," and Fallon gave his spin on "I Will Survive," translated to "I Will Be Punctual." In the end, Anne Hathaway and Jimmy Fallon came together to sing P!nk and Nate Ruess' "Just Give Me a Reason," now known as "Only Tell Me Grounds." Keep an ear out for the hit song "Only Tell Me Grounds" to be played at a block party or Bar Mitzvah near you!